As I plunge into studying Promises, my understanding has halted on the following question that I do not find discussed (all I find are specific discussions of the Promise constructor, and the Promise 'then' function - but not a discussion that compares their design patterns). Function object with two arguments resolve and reject. The first argument fulfills the promise, the second argument rejects it. We can call these functions, once our operation is completed. Because the then method returns a Promise, you can easily chain then calls. From the above code snippet, it seems clear to me that the value passed to the resolve function in Stage 1 (in the second occurrence of resolve - beneath (2), above) is passed on to the next stage (the first then function that follows in the same code snippet). There is no return value at Stage 1. However, it is the return value at Stage 2 that is passed on to the next stage after that (the second then function). Is this lack of correspondence between the design pattern for the creation of a Promise, and the use of the then function on an existing promise (which also returns a Promise), just a historical fluke (one requires calling a callback but returns nothing, and the other returns a value but does not call a callback)? Or am I missing an underlying reason why the Promise constructor utilizes a different design pattern than the then function? Bergi's answer is excellent, and has been very helpful to me. This answer is complementary to his. 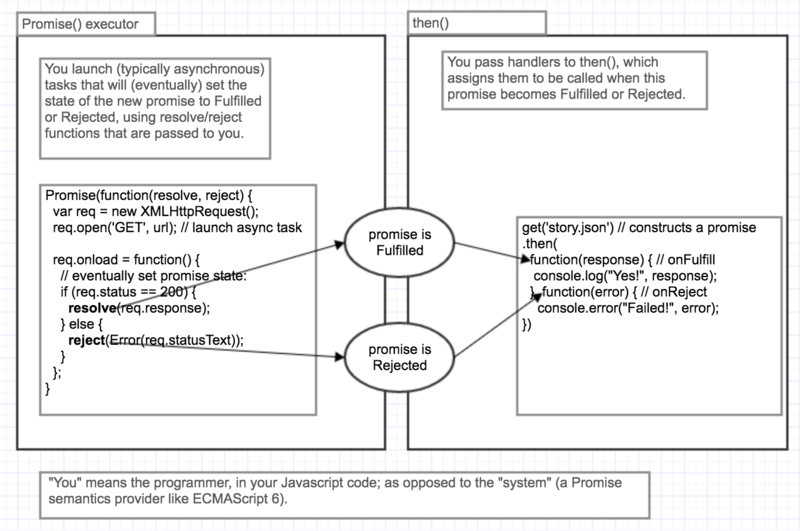 In order to visualize the relationship between the Promise() constructor and the then() method, I created this diagram. I hope it helps somebody... maybe even me, a few months months from now. The main idea here is that the "executor" function passed to the Promise() constructor sets tasks in motion that will set the state of the promise; whereas the handlers you pass to then() will react to the state of the promise. This is a highly simplified view of how things work, leaving out many important details. But I think if one can keep a grip on a good overview of the intended purpose, it will help avoid confusion when one gets into the details. One important detail is that the executor function passed to the Promise() constructor is called immediately (before the constructor returns the promise); whereas the handler functions passed to the then() method will not be called till later (if ever). Bergi mentioned this, but I wanted to restate it without using the terms a/synchronously, which can be confused if you're not reading carefully: The distinction between a function calling something asynchronously vs. being called asynchronously is easy to gloss over in communication. One more detail I'd like to emphasize, because it confused me for a while, is that the resolve() and reject() callbacks passed to the Promise() constructor's executor function are not the callbacks later passed to the then() method. This seems obvious in retrospect, but the apparent connection had me spinning in circles for too long. There is definitely a connection, but it's a loose, dynamic one. Instead, the resolve() and reject() callbacks are functions supplied by the "system", and are passed to the executor function by the Promise constructor when you create a promise. When the resolve() function is called, system code is executed that potentially changes the state of the promise and eventually leads to an onFulfilled() callback being called asynchronously. Don't think of calling resolve() as being a tight wrapper for calling onFulfill()! There is no correspondence between the Promise constructor and the then method because they are two independent things, designed for different purposes. The Promise constructor is only used for promisifying1 asynchronous functions. Indeed, as you say, it is built on invoking resolve/reject callbacks to asynchronously send values, and there are no return values in that case. That the Promise constructor itself does take this "resolver" callback (to which it synchronously passes resolve and reject) is in fact an enhancement of the older deferred pattern, and bears no intended similarity to the then callbacks. The then callbacks in contrast are classical asynchronous callbacks, with the additional feature that you can return from them. They are being invoked asynchronously to receive values. Yes, both do return promises, though they share that trait with many other functions (Promise.resolve, Promise.reject, fetch, …). In fact all of these are based on the same promise construction and resolve/reject capabilities that also the Promise constructor provides, though that's not their primary purpose. then basically offers the ability to attach onFulfilled/onRejected callbacks to an existing promise, which is rather diametral to the Promise constructor. That both utilise callbacks is just coincidential - not a historical fluke, but rather coadaption of a language feature. The whole point of the promise constructor executor function is to disseminate resolve and reject functions to non-promise-using code, to wrap it and convert it to use a promise. If you wanted to limit this to synchronous functions only, then yes, a return value from the function could have been used instead, but that would have been silly since the useful part is to disseminate the resolver and reject functions to code that actually runs later (way after the return), e.g. to callbacks passed in to some asynchronous API. Is it bad practice to have a constructor function return a Promise? When or who does pass resolve and reject functions to JS promises? How is a Promise That Is Returned From A Resolve Handler Mapped To The Return Value of 'then'?